Michaela Zimmer infuses her new series of paintings with a sense of action and physicality. 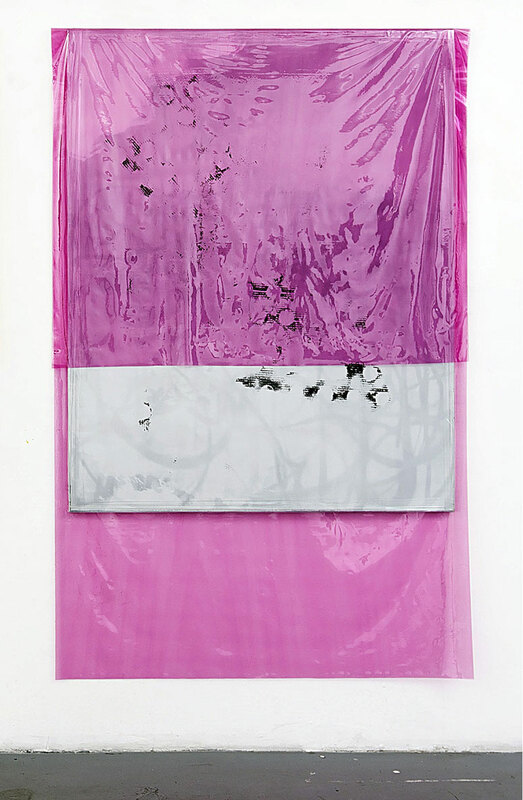 The canvases become a record of a performance, draped and wrapped with brightly coloured plastics, which ripple and contort across the surface, semi-concealing the marks made beneath. These are painted lines, applied in one stroke, with dashes and reflections that often produce multiple layers, some spilling over on to the drape, others slinking away beneath its veil. The size and dimensions of the works directly relate to the artist’s own physical constraints, namely her reach, and their luminosity and mirroring effect draw the viewer in.